(Nanowerk News) By now, due to a cascade of media coverage about nanotechnology, not only the scientific community but the public at large has heard about the huge impact that nanoparticles and their capabilities may have on our lives in the 21st century. But at the same time nanotech applications are expanding the limits of science and medicine, they are stretching the boundaries of intellectual property law. As with other waves of innovation, nanotechnology will catalyze change in social, scientific, and legal arenas. Shifts in the way intellectual property (IP) is defined and administered are already becoming visible as a result of nanotechnology trends. “Universities and companies seem to think there is something quite significant going on here, because they are rushing to the patent office in record numbers to patent nanotechnology inventions,” says Mark Lemley, professor at Stanford Law School and director of the Stanford Program in Law, Science, and Technology. There are multiple questions arising. How do we legally classify these new technologies? Who controls – and benefits from – fundamental innovations that are the foundation for future innovation? How will the government resolve these issues and review patents that do not easily fit into the existing system? Any one of these issues would challenge a field of scientific endeavor; combined, they present the nanotechnology field with a complex legal landscape that will require skill and collaboration to navigate. But this is more than just an intellectual legal exercise. Failing to find a good path around and through these complexities could stifle the development of nanotechnology-based cancer therapeutics and diagnostics and limit the ultimate benefit for cancer patients. At its simplest, the patent system provides for the disclosure of information about inventions. To obtain a patent, an inventor must "teach" the public how to make and use the invention in the best way the inventor knows. Thus, the patent system rewards only those inventors who are willing to share with the whole world by granting them exclusive ownership of their innovation. – A composition of matter, such as a new pharmaceutical drug or a new plastic for use in kitchen counters. The U.S. Patent and Trademark Office (USPTO) oversees the patent process. The USPTO granted over 170,000 patents in 2005, which averages to a patent being granted every three minutes. In general, the USPTO reviewers have focused on discrete areas of expertise for reviewing patents. Patents are routinely licensed to third parties who wish to make use of the invention. (Indeed, the USPTO requires that technology that is patented be broadly shared, although not necessarily for free.) In exchange for compensation, such as a licensing fee and/or royalties on sales, the third party can employ the protected technology. The financial benefits of licenses and licensing fees have made patents even more important for many institutions, both private and public. Parties that use patents without permission are open to a lawsuit for patent infringement – a sometimes lengthy process and potentially expensive for the losing party if it is made to pay damages. The STM was the first of a new generation of tools empowering scientists and engineers to pursue possibilities at the nanoscale. For the biomedical community, access to the nanoscale environment and its unique surface properties and other distinctive characteristics opens the door to a world of transformative treatment possibilities. Along with a new generation of tools came a new generation of IP problems. Nanotechnology applications did not conform to the existing classifications of IP. From an IP perspective, some aspects of biomedical nanotechnology fall easily into one of the four categories. Diagnostic equipment, for example, classifies as machinery and there are few complications with applying IP laws to this category because, in this instance, size does not matter. Materials built on a nanoscale are not treated any differently from their larger counterparts. A quick look at some recent developments in the field highlights just how complex the science behind nanotechnology is – a complexity that may lead to new IP territory. Not only are the applications of nanotech novel and complex, as shown in these and dozens of other examples, but they are characterized by an unprecedented amount of requisite collaboration from diverse scientific disciplines. Unlike other areas of technological IP, nanotechnology-centered IP is distinctive because the technology is typically developed through multidisciplinary expertise, often in fields such as biology, chemistry, engineering, and materials science. Thus, the filing of a nanotechnology patent often involves a team of scientists representing many scientific disciplines collaborating on a technology comprising multiple components, each of which might require multiple IP licenses. Several trends in the nanotechnology patent landscape are directly affecting the biomedical community. From 1980 to 2003, the yearly number of U.S. patents obtained by universities worldwide soared from approximately 250 to 4,000. While universities and public interest foundations typically hold about 1 percent of patents issued in the U.S. each year, this number spikes to 12 percent in emerging nanotechnologies. Since most of the patents issued to date are for fundamental science, Lemley points out, “it is not too surprising that most of those basic research labs are located in universities.” Certainly, the revenue from patents is becoming an important part of the financial strategy of major universities. Nanotechnology is the first technology wave highlighting a shift in IP patterns that favors universities. In the past, private companies drove the trends in IP protection, simply because they dominated the patent landscape. Universities, by contrast, have differing aims from the private sector, where protection of the individual company’s interests comes first and patents may be closely held. As a result, certain lessons on how IP leads to commercialization learned from past waves, such as biotechnology, may not be applicable in this new IP landscape. University patents often emerge from basic science and, without proper oversight, can become overly broad “building block” patents, which protect fundamental concepts upon which all subsequent advances are based. One of the unique characteristics of nanotechnology IP, as differentiated from biotech and other previous waves of innovation, is that a number of “building block” patents have issued from the outset, thereby creating a different dynamic in the IP landscape. “Indeed, many of the most basic ideas in nanotechnology are already patented or may well end up being patented,” says Lemley. These building block patents can be very lucrative because the fundamental technologies they claim may become prerequisites for many downstream innovations, and thus can generate substantial licensing revenues for the university that holds them. The university patenting trend is notable because it reflects a significant change in IP – the concentration of building block patents in one place. Previously, building block technologies were either not patented, or to the extent they were, they were rarely concentrated in one place. Lemley notes many of the other scientific breakthroughs of the past century, from biotech to lasers, ended up in the public domain. The rush to patent nanotechnology’s basic science “may represent the future of innovation,” he says. The exact significance that this shift in power will have on commercialization of biomedical nanotechnology IP is yet to be seen. The complexity of nanotechnology has led the USPTO to undertake several key initiatives to smooth the patent process. “Step one was to begin the process of a classification process,” says Kisliuk. The project involved identifying patents that used key terms related to nanotechnology and then manually reviewing those patents – some 5,000 in number – to create a cross-reference digest. Blaise Mouttet, a retired U.S. patent examiner and a member of the nanotechnology classification team, explains the challenge that confronted the USPTO in these terms: “If there is no centralized nanotechnology art unit, and the nanotechnology patent applications remain scattered among dozens of different art units, then the chance of patent examiners’ being unaware of these concurrent applications filed on the same invention is great.” The agency identified 253 separate international patent classes influenced by the new wave of nanotechnology patent applications. 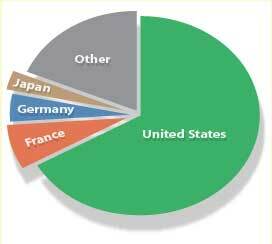 One study of class 977/dig.1 patents reveals that of 792 total patents covering medical and biological applications of nanostructures, 66.9 percent are U.S. patents, followed by France with 7.2 percent, Germany with 4.5 percent, and Japan with 2.9 percent. Of the U.S. owned patents, 20.2 percent are owned by universities. The digest allows the agency to more effectively route patent applications to examiners with the necessary expertise to handle them. Kisliuk says that the USPTO is working to refine the placement even further and to educate examiners so that they have the necessary skills to review applications. Because nanotechnology is a new discipline, “our examiners are not graduating with nanotech degrees,” explains Kisliuk. “Our people are very highly educated, so instead of bringing in people specialized in nanotechnology, we are bringing our current people up to speed.” The USPTO offers monthly training sessions on nanotechnology for examiners. In addition, a core group of 70 examiners has volunteered to help their peers who may have questions about nanotechnology patent applications. At the same time, nanotechnology patents tend to be concentrated in a relatively small number of hands. Although there are some 1,180 patent holders who hold nanotechnology patents, just 95 entities, including IBM and MIT, hold one-half of all nanotechnology patents thus far issued. Given the potential financial rewards of bringing new technology to market, other industries, including biotech, have seen high-profile legal battles over patents; as yet, no such contention has arisen in nanotechnology. Another unique emerging trend is the internationalization of collaboration. Mostafa Analoui, Ph.D., Senior Director, Pfizer Global Research and Development, observes that "the increasing role of nanotech in emerging markets and countries seems to be changing the geographic balance of investment and markets." In addition, the cross-fertilization of technology is likely to lead to greater cooperation in the form of alliances and acquisitions among academic institutions, private companies, and the government. There is already evidence of such collaboration: for example, The Dow Chemical Company appears quite willing to license its dendritic patents, and in one deal signed over 196 such patents to Dendritic Nanotechnologies in exchange for a significant equity stake in the company. Such signs suggest that nanotechnology innovators will be able to surmount IP obstacles and reap the benefits that patent protection offers. “It’s still early in the process to say with certainty, but I am confident that circumstances will necessitate that a cooperative IP spirit, characterized by healthy licensing and perhaps patent pools, will eventually carry the day for nanotechnology innovation, much like it has in semiconductors and electronics – other industries with similar multi-layered technology platforms,” says Murdock. And if this vision is achieved, there may indeed be an opportunity for the innovators of nanotechnology – and the biomedical community at large – to fulfill the clinical potential that the scientific literature and the media have spotlighted.